Dogs are allowed on a six-foot leash at Wrights Beach and in campgrounds, picnic areas, and parking areas, but are not permitted on other beaches or coastal trails, or at Goat Rock. Sonoma Coast State Park is not a single site but rather a collection of beaches, campgrounds, bluffs, crags, and headlands that stretches for 17 miles along the rugged Sonoma Coast from Bodega Head north to the Vista Trail, just beyond Jenner. Much of it is steep and rocky, and inaccessible to wheelchair riders, but you may find it worthwhile to stop at many of the parking lots and pullouts to enjoy the scenery, including prominent rocky sea stacks, crashing ocean waves, and boats bobbing in the harbor. 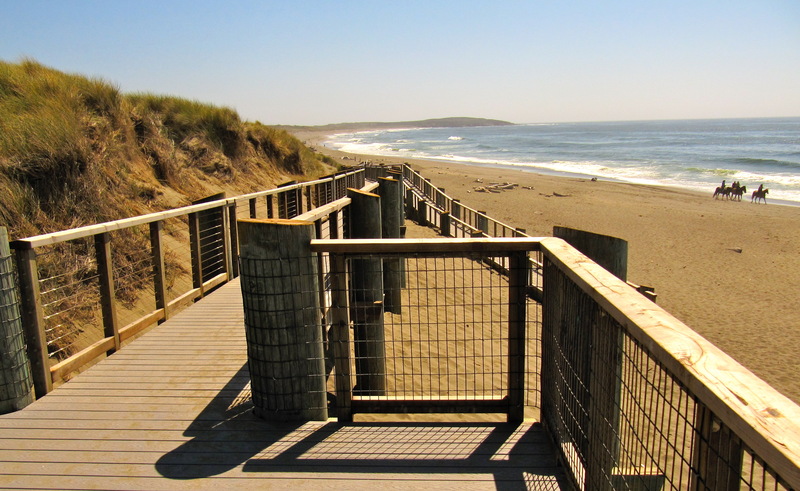 Bodega Dunes, Pomo Canyon, Wright's Beach, and Willow Creek campgrounds have accessible features, and an accessible boardwalk at Bodega Dunes takes you through the dunes and down a switchbacked ramp to the beach. A new 1.5-mile loop trail at Bodega Head is expected to be complete by late 2010; currently only about a half-mile is accessible. At Wrights Beach you will find limited access to the beach and an entrance to the Kortum Trail, which is accessible for part of its length and is particularly lovely when wildflowers are in bloom; another Kortum Trail entry is at Shell Beach to the north. Dangerous rip currents, heavy surf, and sudden drop-offs (all of which make the ocean spectacular to look at) make swimming along the Sonoma Coast unsafe. Trail Overview: A breathtaking view of the ocean awaits you if the section of boardwalk from the parking lot to the overlook platform is passable; it can be covered in sand blown from the surrounding dunes. 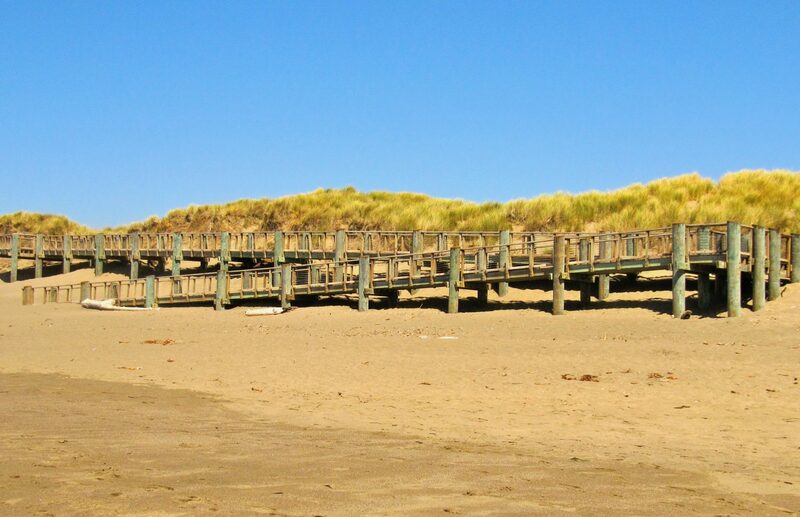 From the parking lot you'll climb a short, gentle slope on a well-worn, rippling boardwalk that leads through dunes. After about 300 feet you connect to a new 350-foot-long switchbacked stretch of boardwalk made of composite boards, then descend to the beach. At its end is a large concrete pad that puts you as close to the ocean as you'll get anywhere on the Sonoma Coast. On a clear, windless day it was just me and the ocean; I felt as if I had arrived in paradise, and I didn't want to leave. More Info: Conditions on the boardwalk can vary daily due to shifting sand. On one of my visits in summer it was impassable. Call the Salmon Creek ranger station the day of your visit for information: (707) 875-3483. Yes – Restrooms with varying degrees of access are at Wright’s Beach campground, Shell Beach and Bodega Head parking lots, Bodega Dunes day-use, and the Vista Trail. Yes – Call the Salmon Creek ranger station at least 24 hours in advance to arrange for a beach wheelchair at Bodega Dunes: (707) 875-3483.